When the day came for me to board the airplane for the United States, I was truly excited. I was also totally unprepared. It is not very fashionable nowadays for a Chinese person (or even some Americans) to say this, but I truly love America. I’d like to think that my love for this country is the warm and gentle kind that doesn’t take away my love for my native land, nor my awareness of America’s problems. Like being in love with a person, it is a great feeling. It is also quite a turnaround for someone born in China in the mid-1960s. I was indoctrinated early on with the idea that America was synonymous with “decadence” and “evil.” It wasn’t until Mao died in 1976 that perceptions began to change—China was going to open up. By the time I became a student at Peking (Beijing) University in 1983, America was no longer the enemy. We were told that we should learn as much as possible about America and the world. So I became an English major. To learn the language fast, I buried myself in the massive library to read English books, from cover to cover, the thicker the better. As my comprehension of the language improved, I began to be shocked by what I was reading. From a biography of Harry Truman, I realized for the first time how world events could be viewed from very different perspectives. In the English listening comprehension class, we watched American and British TV programs and movies that were never shown to the public in China. I was captivated by the America series by Alistair Cooke, a British émigré to the United States who endorsed his adopted country with such enthusiasm that I found myself wanting to know more. In July 1985 I was notified by the English Department that I would have an opportunity to study the next year at a place called Wabash College as a “Robert Winter Scholar.” I was told that Winter was an American who lived most of his life in China. He had taught at our school but retired years ago. Although the old American intrigued me, I was soon too consumed by the complex process of getting out of China (very few Chinese travelled abroad then) to think about him. It wasn’t until years later, as I read Professor Bert Stern’s book Winter in China: An American Life, that that I learned that Winter, a Crawfordsville native, was one of Ezra Pound’s students during the poet’s brief tenure at Wabash. Pound left Wabash for Europe, and, a few years later, Winter left for China. During a stretch of 30 years when America and China were practically at war, Winter—as one of a handful of Americans who remained—became a quiet but potent symbol who connected the two cultures for his Chinese students through his teaching of the English language and his introduction of Western ideas in a country then swept by xenophobic fever. Although certain things about his native land might have bothered him (growing up Catholic and gay in the early 1900s didn’t help), as Professor Stern points out, Winter never abandoned his Western and American ideals. At the same time, because of his fascination with a foreign culture, he was able to find ways to thrive in an environment that was utterly alien. That any American could live in such an unforgiving place for so long is unfathomable. That he could survive and work in that environment the way Bob Winter did is a life worthy of a Hollywood script. I had at least one thing in common with Winter: a complete fascination with foreign culture. When the day came for me to board the airplane for the United States, I was truly excited. I was also totally unprepared. I left China with $20, the maximum amount of foreign currency the Chinese government would allow its citizens to exchange and carry outside the country. When I had to spend a dollar in the San Francisco Airport just to use the luggage cart, I thought, My God, $19 is all I have left, and it’s a long way to Indiana. I had read about United States history and politics, but I wasn’t prepared for the daily details of life in America. I walked to the Kroger grocery store and, when I didn’t know what was inside some of the boxes on the shelves, I began to open them in the store to sample them. “Sir, you can’t do that,” one of the employees said. I apologized, but I still had no idea what those boxes contained! Some challenges were more subtle. I had trouble making decisions—from small things, such as what classes to take, to planning for my future. I realize now that decision-making was a novel concept for me due to the society I grew up in (where all decisions were made for you). I had to learn it from scratch in America. In many ways, I grew up again in Wabash and Crawfordsville. Dr. Bert Stern and his wife Tam, whom I briefly met at Beijing University, where Professor Stern had taught for a year, took special care of me. I can’t forget how Professors Don Herring and Peter Frederick offered to spend their lunch hours helping me with my studies. I learned a great deal from my classmates, as well. I still keep in touch with David Kirtley ’88, my senior year roommate who I first met in the Glee Club, and with Tan Zhenming, a fellow Robert Winter Scholar from Beijing University. But in that first year I was thousands of miles from home, I didn’t have a car and couldn’t have driven it if I’d had one. I was homesick, and I felt completely cut off from my culture. That began to change the day before my first Thanksgiving. 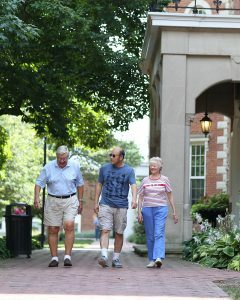 Ken Sun walks with Lyle and Judy Schmidt during a reunion on the Wabash campus last summer. I was working in Lilly Library when a middle-aged woman approached and asked if I wanted to join her family for Thanksgiving. It took me a while to shake off my suspicion about this stranger’s motives (another habit from my native culture). I didn’t know much about Thanksgiving, but I had heard about turkey, and I was prepared to try it. The other food at the feast was unexpected. I tried most of it, though, and after the meal I took a long walk down the railroad tracks with Judy and Lyle Schmidt’s college-aged children. Judy became a lifeline for me. She seemed to understand my need to get news of my home country. She would send me clippings about China almost weekly. She said I was always welcome in her home. In the next few years through interactions with Judy, Lyle and their family, I observed firsthand how Americans think, live, struggle, and love. They became my American family, and I began to feel at home. By the end of my first year I wanted to stay for a second. I wrote an article around that time that was published in the Wabash alumni magazine. The decision to stay or go was not entirely mine. My scholarship lasted for one year only, and, without it, I would have no choice but to return to China. So I asked Peking University for a second year. The world has changed drastically from the day I graduated from Wabash in 1988. Thousands of Americans now visit or stay in China; more Chinese do the same here. Technology has reduced the distance between the two countries; the whole world has shrunk. Yet technology and prosperity do not necessarily soften the cultural divide. When I arrived in the U.S. in 1985, China was just opening; we were curious about the world around us. Today, money and a growing power have made some Chinese think and act as if the outside world no longer matters. For years, Americans have been accused of the same attitude. Part of the problem is human nature—we tend to cling to what’s known and familiar, because that brings us comfort. Political leaders everywhere figured out long ago that the politics of division, fear, and xenophobia is an easy way to capture hearts and minds. Under this new geo-political dynamic, Sino-American relationship today is in many ways worse than it was 30 years ago. Back home, America is becoming racially and culturally diverse at a rate unprecedented in history. To integrate such diversity and carry on the values and traditions that have made this country great is going to be a big challenge. We’re all going to have to step out of our comfort zones. This is why the life of Robert Winter is more relevant than ever. His is a story of an American who went to a foreign land to teach and instruct, but with a heart to learn and accept. One of his most enduring gifts was his ability to derive comfort from the unknown. He thrived in an environment that was unfamiliar to him. For the past 20 plus years, I have been living and raising a family in the San Francisco Bay Area. Like other Wabash men, with hard work and some luck, I have been able to live my share of the “American Dream,” for which I am grateful. Sometimes I wonder, though, if it is my calling to live and fade away as an accountant in California. The question is: How can I best live out the legacy I have been given, as an American citizen born in China, who graduated from Wabash College, thanks to a man like Bob Winter? I have no answer for this yet, but there is adventure and excitement in the question. If I can figure it out, credit the two great cultures—East and West—that have nurtured me. Thanks to the spirit of Robert Winter and my Wabash education, I see the unknown not as something to fear, but to embrace. Travelers' Advisory: "Choose the Complete Unknown"